A father and son crash on what used to be the sanctuary of humanity, Earth. A place in which is now overrun by animals who have evolved over the years to kill humans. With his father critically injured, the son, Kitai, must make his way through rigorous, uncharted terrain to signal for help. Continued trust, communication and understanding with each other is the only way they're going to get home. Will Smith teams up with son Jaden to lead this epic tale. They are also joined by Isabelle Fuhrman and Sophie Okonedo. Australia's Lincoln Lewis also gets some screen time. Directed by M. Night Shyamalan. Look! It's a bird! It's a plane! No, it's hopefully DC Studios redeeming their flopped previous attempt to reincarnate the Superman franchise! Let's face it team, "Superman Returns" the film that was released back in 2006, raised a few eyebrows. Although not a complete dud, the film did not generate enough hype or money for them to say, "Let's do it, let's produce the follow up feature". However seven years later, the boy in the blue spandex is back, and it looks as if he's never looked better. When young Clark discovers he has powers that go beyond his believed to be home of Earth, he goes in search of where he's come from. His visit to his home planet generates a lot of interest towards him from it's inhabitants, which puts Earth in the firing lane. However, before he can save Earth, and the people he loves from invaders of his home planet of, Krypton, Clark must first discover the hero inside of him. They've decided to strip it back in the "Man of Steel". It's going right back to the beginning, and it will introduce to a whole new audience who the Man of Steel is. Henry Cavill is Superman, and he's joined by Amy Adams, Kevin Costner and Australia's own Russell Crowe. I couldn't go past putting the "Monsters Inc" sequel in this issue's must see. The original is so dear to me, and I can't wait to see the sequel. It's the first film I saw more than once in the cinemas, in which I saw three times! It's actually also the first and last film I ever saw with my grandmother. I know it's an animation, but there's nothing shameful about enjoying kids films. The second installment to Monsters is actually a prequel to the original film. 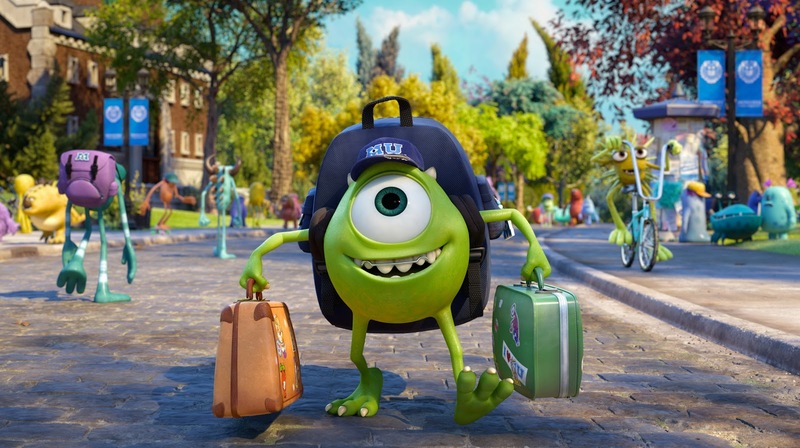 It takes us back to where the friendship of Mike and Sully first began. It may be hard to believe, but Mr. Sullivan and Mr. Wazowski weren't always best mates. They actually started out as enemies. Follow their journey to becoming not only best mates, but the faces of Monsters Incorporated. John Goodman and Billy Crystal return to voice this lovable duo. They're accompanied by Aubrey Plaza, John Fillion, Helen Mirren, John Krasinski and repeat offender Steve Buscemi. Directed by Dan Scanlon. Our world is increasingly becoming digital. We do everything online, we talk, we plan, we book, we buy, we even date. The world is literally at our fingertips. Unfortunately the digital revolution has cost many people their jobs. With more of the work being automated the need for the extra bodies around a business is becoming less and less. That's exactly the case for two salesman who have been victims to the ever growing digital age. When they lose their jobs they're forced to find new means of employment. Regardless of their years of life experience finding proper employment is proving to be difficult, until they land an internship at the world's greatest search engine, Google. Being decades older than all the other candidates, and not having any idea of how most of the technology works, the chances of a getting a position aren't in their favour. "The Wedding Crashers" duo, Vince Vaughn and Owen Wilson are Google's latest interns. They're joined by Australia's Rose Byrne, John Goodman and Max Minghella. Directed by Shawn Levy.